Up to 90 per cent of receipts contain cancer-causing chemicals, experts have warned. Receipts which use ink that fade over time are made with 'thermal paper' which contains BPA (bisphenolA). Studies have shown the chemical can lead to hormone-dependent cancers, and has previously been linked to infertility, autism, ADHD, obesity, type 2 diabetes, premature births and early onset of puberty. There are already concerns about the public being exposed to BPA, which is often found in plastics. We should avoid storing receipts in purses, wallets, or cars, according to Professor Nicolás Olea, from the University of Granada, Spain. BPA is added to receipts to make their writing darker without using ink, and is also found in plastic water bottles and food containers. International researchers, led by the University of Granada, analysed 112 thermal paper receipts and tickets from Brazil, Spain and France. 'We can recognize this kind of paper because it instantly turns black if we put it close to a heat source like, for example, a match,' Professor Olea said. The French government has taken action to the reduction of the use of that chemical compound in thermal paper since 2014. The researchers warn that we should be careful about handling the receipts. 'For example, tickets should not get in contact with food – for instance, meat or fish – while unpacking it in the kitchen,' Professor Olea said. 'Moreover, we should not crumple the tickets to throw them in the trash, play with them, write notes on them, or store them in cars, purses or handbags. 'In short, we should manipulate this kind of tickets as little as possible. 'They are easily identified by the customer since they are those receipts that, after some time, lose what they have printed on them and, when you are going to return the trousers you bought, the cashiers tell you that they cannot see anything. Scientists have sought alternatives to gradually replace BPA in an array of items. BPS was designed as a replacement after mounting concerns over the plastic compound's effect on human health. France has used BPS as a replacement in its receipts. However, scientists aren't on board with this chemical either, believing that BPS is also a hormone disruptor. 'Unfortunately, BPS is also an endocrine disruptor, and its environmental persistence is greater than that of BPA, so it's not a valid option,' Professor Oleo said. 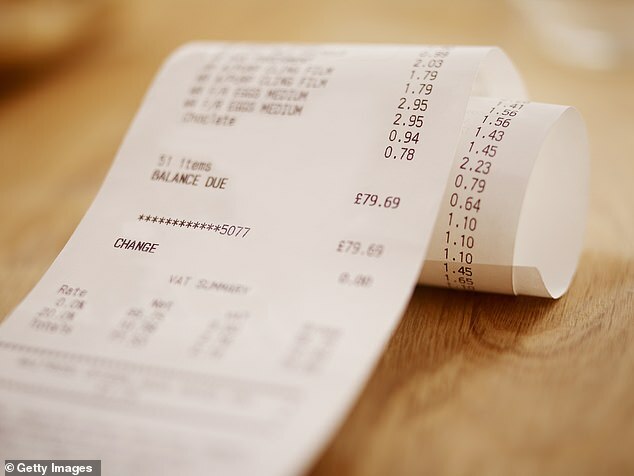 The researchers suggested people 'reject' paper receipts until public health measures are taken, noting that the Spanish government promised to remove BPA from its receipts by 2020. Similar findings were published by Michigan-based non-profit organisation The Ecology Center in January 2018. The team analysed 207 paper receipts from a variety of businesses collected between January and April 2017, including nationwide grocery and homeware stores, gas stations, theaters, libraries and small independent businesses. Past research reveals cashiers and waiting staff can handle as many as 30 receipts an hour, and after a shift, have significantly higher BPA and BPS levels in their blood and urine than the average person. 'The protection of hundreds of thousands of young people working as cashiers in supermarkets and other stores is not as strictly implemented as it should,' Professor Oleo added.